Being a bit of a contrarian, I try to avoid hot technology stocks — like Nvidia Corporation (NASDAQ:NVDA) — that are priced to perfection in favor of competitors trading at lower valuations. NVDA stock is up 56% so far this year, with most of the gains made in the wake of the company’s May developer conference. How much of a contrarian am I? I recently recommended buying Bayer Motoren Werk (ADR) (OTCMKTS:BMWYY) stock instead of Tesla Inc (NASDAQ:TSLA). BMW trades at a lower valuation and has a long history of generating cash flow. Unlike Tesla, Nvidia boasts both profits and positive cash flow. But Nvidia is one of the most expensive stocks in the S&P 500, one of only seven stocks with both price/book and price/sales multiples both above 10. A little more than 4% of that 2017 gain has occurred since June 23, when I cautioned investors to steer clear of NVDA stock. This valuation puts a lot of pressure on Nvidia, and if it stumbles, investors will punish the stock. Witness what they did to Tesla after a delivery report. To be clear: I don’t recommend shorting NVDA (or any other shares, for that matter). Keynesian wisdom has it that “the market can stay irrational longer than you can stay solvent.” In cases like this, where the market is driven mostly by sentiment rather than fundamentals, it’s difficult to predict exactly when sentiment will shift. Nvidia stock could continue rising for quite a while. Still, I would rather pass on the shares and look for something trading at more conservative valuations. Will Nvidia Dominate AI Hardware? 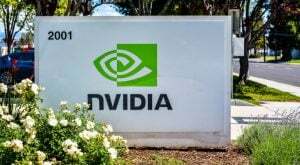 The two biggest sellers of graphics processing units (GPUs), Nvidia and Advanced Micro Devices, Inc. (NASDAQ:AMD), saw their stocks soar over the past 16 months. AMD stock rose 572% while NVDA climbed 420%. Revenue increased 38% year-over-year for NVDA and 15% for AMD. Not bad, but this alone does not tell the whole story. Interest in artificial intelligence (AI), machine learning and deep learning is rising, and so will demand for computer chips to run these programs. Robotics market consultancy Tractica sees the market for deep learning hardware growing to $41.5 billion in 2025 from $436 million in 2015. GPUs, a market Nvidia shares with AMD, currently dominate deep learning hardware. As machine learning and AI take off, so will sales of GPUs, propelling NVDA stock. This prompted some analysts to crown Nvidia, calling it the next Intel Corporation (NASDAQ:INTC), or the Intel of AI. And the market seems to agree: NVIDIA has already topped QUALCOMM, Inc. (NASDAQ:QCOM) in market value. But machine/deep learning and AI are still in their earliest stages, and it isn’t clear if GPUs will prevail. Application-specific integrated circuits (ASICs) and field-programmable gate arrays (FPGAs) may also play a role. Alphabet Inc (NASDAQ:GOOGL, NASDAQ:GOOG) made its own ASIC chip last year, its Tensor Processing Unit (TPU), and released a new version this year which beat Nvidia’s P40 in performance per watt. And Microsoft Corporation (NASDAQ:MSFT) is using FPGAs made by Intel in addition to GPUs to power deep learning operations on Microsoft Azure. Some see machine learning following the path that cryptocurrency mining took: first from CPUs to GPUs, then to FPGAs, and finally to ASICs. It isn’t yet clear that GPUs will be the future of machine learning, or if Nvidia will sustain its dominance. With all these uncertainties, do you really want to buy NVDA stock at over 12 times sales and nearly 16 times book value? I would rather follow the advice of Citron’s Andrew Left, who recommends moving money from Nvidia stock to Alphabet. Among major companies, Alphabet has also made the most AI-related acquisitions, according to the research firm Quid. And GOOGL has the world’s most AI scientists, with Microsoft and Baidu Inc (ADR) (NASDAQ:BIDU) coming in second.Alphabet has used machine learning technology for years in things like Google Translate and Image Search. Waymo, the company’s self-driving car division, also uses AI and machine learning. GOOG stock trades at a much lower valuation than NVDA stock while occupying a space with high barriers to entry, and it’s even a little more bargain-priced thanks to a post-earnings-beat decline in Monday’s trade. Still, the explosion in data may very well strengthen Alphabet’s position. Article printed from InvestorPlace Media, https://investorplace.com/2017/07/nvidia-corporation-nvda-stock-is-no-longer-the-best-play-on-ai/.